Georgy Kurasov was born in 1958 in the USSR, in what was then Leningrad. He still lives and works in the same place, but now the country is Russia and the city is called St Petersburg. Without any effort on his part whatsoever, Georgy seems to have emigrated from one surreal country to another. His native city was irrational from the very moment of its foundation. Situated on the same latitude as the southern shores of Alaska, on the swampy delta of the River Neva where no one had ever settled before, this new capital city grew up on the very edge of a monstrous empire. Here on the totally flat surface carved across by rivers, streams and canals, European architects laid out, like images on a canvas, straight avenues, streets and squares, they built Greco-Roman porticoes and Baroque palazzi, erected sculptures and fountains, amidst something akin to permafrost where half the year is dominated by ice and frost and the other half by damp and rain. It is hard to find a more artificial – more artistic – city. Georgy spent his childhood on the Petrograd Side, to the north of the city, in a tiny little flat with windows that looked out onto an even tinier courtyard. As far as he recalls, he modelled things in plasticine and drew resting on the vast wooden windowsills. Not so much aesthetic pastimes as compensations for the grey minimalism of everyday life, the absence of light and bright colours. At thirteen years old his mother put him in the art school attached to the Academy of Arts. At the interview it was politely explained that there was nothing for Georgy in the painting department since he had a total lack of feeling for colour. So they suggested Georgy Kurasov join the sculpture class. In some way he was pleased, since all the painted images they showed him seemed terribly boring, and Georgy had great interest in form. That was when he began his professional training. 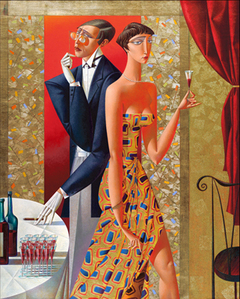 In 1977 Georgy Kurasov entered the sculpture department of the Academy of Arts. He spent six years in the vast studio of a building erected during the time of Catherine the Great, in the late 18th century. Those gloomy, narrow, incredibly high vaulted corridors, the vast, cold, grimy studios, everything was inhabited by the ghosts of long dead masters of ages past, whose influence was far more real than the insignificant apologists of Socialist Realism and of Marxist-Leninist aesthetics. The Academy was a solid amalgamation of temple to and prison of the arts. Yet those years in the Academy were the best years of his life. Nearly all Georgy’s friends and colleagues date from those years. The circles he moved in were intellectual, talented, young – which meant free, with the exception of the one or two informers that were simply an obligatory element of life in those years and did little to alter the overall picture. It was then that Georgy met his wonderful Zina, who was later to occupy nearly all his space, both physical, in his life, and creative, in his works. Almost immediately after his diploma Georgy Kurasov was called up for army service, but even there he was armed not with a rifle but with paints, since he was lucky enough to be appointed Court Artist to his general. In 1984 Georgy Kurasov was at last demobbed. He was free. It was not the easiest of times. In order to take part in exhibitions you had to have something to display. And in order to create that something to display, you had to have a place in which to create it. Georgy had nowhere. At last, however, he managed to join the happy ranks of members of the Union of Artists, was allocated his tiny studio, and thought he was at the very peak of happiness. All around him the country was in turmoil, at the very heights of Gorbachev’s ‘perestroika’, people passionately quenching their thirst for information whilst battling with a hunger of somewhat more concrete physical nature caused by food shortages. Things were now rather difficult for artists, particularly as far as sculpture was concerned. Sculpture, as is well known, is an art form for either rich or totalitarian states. The totalitarian state had ceased to exist but it had not become rich. Georgy Kurasov started to paint, but it soon became clear that selling his pictures for any acceptable price was going to be impossible, and so he had to feed his family by producing small pastels which Georgy sold through small galleries dealing mainly in souvenirs for foreign tourists. In 1991 the Soviet Union collapsed. By that time Kurasov had put together a large body of paintings, but had absolutely no idea what he was going to do with them. The future looked bleak. Then in 1993 his works were first exhibited in the USA. Since then, Georgy Kurasov have exhibited and sold his paintings exclusively in North America.